Although it certainly has a lot of the superficial trappings of a classic "natural monster" horror film (as well as suggestions of other subgenres), Arachnophobia never really settles down to reside in the genre. Fans who like their horror to be scary won't find much to rave about here unless they come to the film with an almost irrational, deep-seated fear of spiders. Worse, fans who become easily irritated by quirks might hate Arachnophobia, because this is a film chock full of them. In the beginning, they're as slight as Hannibal Lecter in a pink chiffon jacket. By the midway point, the film is a veritable three-ring circus. Of course to some of us, Hannibal Lecter in a pink chiffon jacket sounds like a good thing. It does to me. But that's the hinge for this film, and takes up enough of the door that "genre fan" here necessarily means someone who doesn't mind their horror with a Steve Martin arrow through its head. Director Frank (Alive, Congo) Marshall first deposits us into a film that looks like it could go full-on Ruggero (Cannibal Holocaust) Deodato at any moment, although a Deodato with gorgeous cinematography--the shots of Venezuela are stunning. On the other hand, there's an odd kink present almost immediately. The story first centers on Jerry Manley (Mark L. Taylor), a reporter sent to do a story on Professor James Atherton (Julian Sands), an entomologist ferreting out new species. Nothing too unusual about that, but Manley knows absolutely nothing about South America, wilderness areas, hiking, etc. He's apparently a sports journalist. It's a classic set-up for a fish-out-of-water comedy, only Marshall and the herd of writers don't give any rationale behind the dehydration. 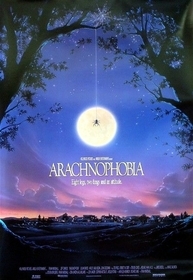 But the film's called Arachnophobia, and all of Atherton's dialogue sounds like a National Geographic special, delivered by Sands in his best "no-I'm-not-just-reading-a-biology-textbook-to-you" style, so we know it's not just going to be a comedy with Manley doing pratfalls down mountains. And sure enough, we soon see something that looks to a non-entomologist like a large, vanilla tarantula. Manley's bitten, and almost immediately confirms that yes, we are in a monster movie. (1) It stars Jeff Daniels, who would seem like he was doing a comedy even if he was in, well, Gettysburg. (2) The main thing we know about the town coroner is that he likes to eat while doing autopsies, he likes to eat at parties, he likes to eat while watching television, etc. (3) John Goodman has a weighty supporting role. Not only that, this one makes King Ralph look like he was doing Gone With The Wind. (4) Just in case that doesn't seem humor-oriented enough, Stuart Pankin has a large supporting role, too. Sure it has lots of spiders, but on the other hand, the absurdity of the lots of spiders and the absurdity of the conclusion (not the epilogue), all filmed with that sweet, family horror film charm, make it so you don't need to see the Amblin logo to know that Spielberg was involved with the film in some way (as executive producer). Surely, that some of you are by now saying, "Yikes! That sounds like a mess, I'll avoid it at all costs" means that I've done my job. It doesn't sound like a mess to me. 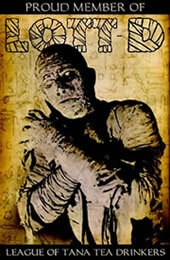 I love lots of cheesy horror. I like Jeff Daniels. I don't mind cliches, especially when they're being made fun of. I love John Goodman. I love Spielberg, manipulative cornpone and all. Heck, I even like spiders. Atmospheric it's not. It's also not scary or gory. It is quite often suspenseful. So, watch Arachnophobia only if you like the same kinds of things that I do. Watch it especially if you're a John Goodman fan. Although his role doesn't occupy as much screentime as we'd like, this is classic Goodman in all his oddball glory. Arachnophobia is not likely to go towards the top of your favorite films list, but it is an enjoyable way to kill a couple hours. When they say No Animals Were Harmed in the Making of This Motion Picture, they mean it! For a scene where John Goodman steps on a spider, a small plug was taken out of his shoe so that the arachnid could fit under it and go unsquished.